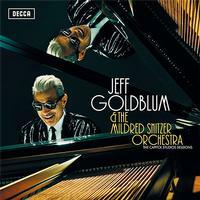 Fans of Jeff Goldblum's films may or may not know of his jazz pianist skills but have a spin of this new album and be messmerized. Goldblum puts on jazz shows at The Rockwell Table & Stage in Los Angeles. Every Wednesday night (that Jeff isn't filming something) you can be treated to wonderful music and Jeff's witty humor in an intimate jazz lounge setting. Here, the actor is joined by his band, The Mildred Snitzer Orchestra, as well as Sarah Silverman, Haley Reinhart, and more. There's more to Goldblum than his iconic roles in films such as Jurassic Park and Thor: Ragnarok. An accomplished pianist, he's been performing at jazz clubs around Los Angeles and New York City with his band, The Mildred Snitzer Orchestra, since the '90s. Now, he's finally ready to share his debut album, The Capitol Studios Sessions, on November 9, 2018. Joining in for this unique recording experience were singers like Irish superstar Imelda May (“Straighten Up & Fly Right)” and former American Idol standout Haley Reinhart (“My Baby Just Cares for Me”). Comedian Sarah Silverman also features on the 1920 classic “Me and My Shadow”, while Grammy-winning trumpetest Till Brönner appears throughout.